Whether you are Apple, Android or Windows lover we have something for everyone. In this article, we are bringing top 5 tablets which are available in the market and you can get it right now. Apple fans that simply want to browse the web, run apps, and play games don't need to spend upwards of $600 on a new iPad. The $329 tablet, introduced in March, is more than capable of handling those tasks. It employs the same A9 processor as the iPhone 6s and has a screen that's about as sharp as that of the iPad Pro. Although the Pro is more powerful, the standard iPad is still useful for getting work done, especially when iOS 11 launches this fall. While it won't work with the Apple Pencil or Smart Keyboard, you can pair it with a third-party keyboard like those made by Logitech and Belkin. Here are the other big differences between the iPad and iPad Pro: storage options cap at 128GB instead of 512GB, it has an 8-megapixel camera instead of 12 that doesn't record in 4K, and there are two speakers instead of four. The screen is also slightly smaller than the 10.5-inch Pro and has a lower refresh rate, which may make scrolling a bit slower. But none of these differences hamper the experience so long as you're not a professional media editor, and just looking to do things like watch Netflix, check email, or browse the web. With an eye-popping screen and a stylus built-in, Samsung's Galaxy Tab S3 is a worthwhile candidate for Android fans. 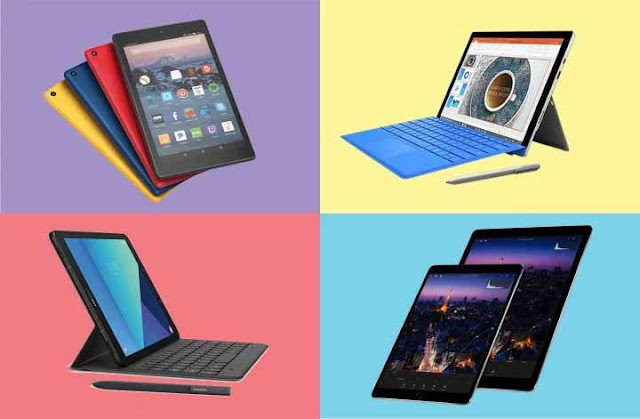 The tablet will feel familiar to those who've used the company's Galaxy phones in the past since it shares some of its physical characteristics like a glossy finish. But it's really the Tab S3's screen, which utilizes a Super AMOLED panel (unlike Apple's iPads), that makes everything pop, with much bolder and vibrant colors than are possible on conventional LED screens. What makes the Tab S3 a better value than Microsoft and Apple's offerings is its inclusion of Samsung's S Pen stylus. By contrast, Apple charges $99 for the Apple Pencil, while Microsoft's Surface Pen weighs in at $59.99. The S Pen can do more than the Surface Pen or Apple Pencil, too, including handy features like hovering over a word or phrase to translate the text. The software also supports multitasking capabilities that make it possible to view apps in split screen mode and send content between your phone and tablet. If you're committed to Apple and looking for a productivity-focused tablet, consider checking out the iPad Pro. The newest model now comes in a smaller 10.5-inch size form, in addition to the significantly larger 12.9-inch variant. Apple high-end tier also includes new screen tech that makes scrolling smoother, a zippier processor and the same 12-megapixel, 4K shooting camera found on the iPhone 7. And of course, the Pro models are the only iPads compatible with Apple's Smart Keyboard and Apple Pencil. The iPad Pro is best suited for those who intend to use it primarily for tasks that require hefty processing power or need more screen real estate and storage space (like professionals who frequently edit photos or design 3D models on the go). For most other tasks, the cheaper standard iPad is more than sufficient. Those in need of a tablet that's better at replacing a PC should give Microsoft's Surface Pro a try. Like many Windows tablets, the Surface runs Windows 10, meaning it's capable of running full desktop programs. Microsoft's Surface stands out for its adjustable hinge, slim yet comfortable keyboard (sold separately) and sleek design. The most recent Surface Pro model, which Microsoft released in June, is 20% faster than the Surface Pro 4 and includes a redesigned kickstand that's more flexible. I also prefer Microsoft's keyboard cover and Surface Pen to Apple's accessories: the Apple Pencil does little more than draw and shade, while the Surface Pen's top button functions as a shortcut for pulling up stylus-optimized apps. Be sure to give the previous generation model a look, too. The Surface Pro 4 starts at $649, which is $150 cheaper than the fifth generation's $799 base price. The older version runs an earlier version of Intel's Core i-processor, but there's little else that differentiates the two. If you're after a cheap tablet for basic reading or sharing with the kids, consider Amazon's HD Fire 8. The $79.99 tablet has your Kindle library built into the operating system, making it possible to jump back into your current read by swiping to the right of the home screen. The Fire HD 8 runs on Amazon's Fire OS software, which is based on Android, so it offers many popular apps found in Google and Apple's respective app stores. The 1,280-by-800 pixel resolution screen is notably less sharp than those found on pricier alternatives, though that's to be expected of a sub-$100 tablet. The Fire HD 8 is available in 16GB and 32GB storage options, but there's an SD card slot for expanding that up to 256GB. Plus, it comes with Amazon's voice-enabled assistant Alexa, which can be accessed by holding down the home button. The Fire HD 8 is also an exceptional choice if you plan to share the tablet with children and other family members. Users can build their own profiles, including one for children with content restrictions, educational goals, and time limits. And the tablet's casing is less fragile than those of premium models like the iPad and Galaxy Tab S3, easing concerns when tossing it in your bag without a case or handing it off to a clumsy family member.